Major Burrows is a boss in the games Super Mario Galaxy and Super Mario Galaxy 2. He lives on one of the planets of the Gusty Garden Galaxy and is the leader of the Undergrunts that wreaked havoc there. He also reappears as a returning boss in Super Mario Galaxy 2, in the Boss Blitz Galaxy. Major Burrows is an abnormally large and pudgy, maroon-colored Undergrunt. He wears a spiked blue helmet that resembles a Spiny Shell, which he also uses to burrow back into the ground. He is also shown to have light blue eyes that are often dilated when his expression changes. 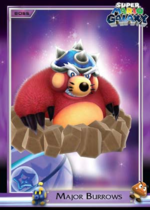 He has long white eyebrows similar to Bowser's, and large rounded cheeks. He also has three whiskers on each side of his snout and a big, black nose. He has a large, tannish-colored rounded belly, and a short flesh-colored tail, which serves as Major Burrows's weak spot. Burrows also has long, sharp, black claws that he uses to attack Mario with. When angry, Major Burrows's blue helmet turns red, and his eyes are golden yellow with no visible pupils. In Super Mario Galaxy, Major Burrows appears in the Gusty Garden Galaxy's level "The Dirty Tricks of Major Burrows" where he is chasing a Star Bunny around a large tree. Initially, Major Burrows is unaware that Mario (or Luigi) has landed on his planet; when Mario Ground Pounds near Major Burrows before Spinning into him, he will forget about chasing after the Star Bunny and lock his sights on Mario. When Mario performs a second Ground Pound, Major Burrows will attempt to run away after being stunned. Once Mario has caught up and performed his second Spin, Major Burrows will become very angry and turn red. When Mario stuns Major Burrows for the third time, he will retreat back underground and come back fully restored, while charging furiously at Mario. When Mario performs a fourth and final Ground Pound, Major Burrows will attempt to run away again. When Mario catches up and performs his third and final Spin, Major Burrows will release a Power Star. The player faces Major Burrows again during the Daredevil Comet run; this means the player will only have one life point. In the credits, there is a picture of Mario fighting him. Major Burrows is the third boss Mario fights in the Boss Blitz Galaxy. His battle is exactly the same as the one from Super Mario Galaxy, although there is no Star Bunny present, and he will release a Launch Star which leads to Bouldergeist's planet instead of a Power Star. Holy Mole-y! Major Burrows lives on one of the planets in the Gusty Garden Galaxy, and when Mario first sees him, he is trying to munch on a cute Star Rabbit! Force him out from underground with a good ground pound, and strike him three times with a star spin to the tail. After Mario defeats the Major, the thankful Star Bunny rewards him with a Power Star. Koichi Hayashida, the director of Super Mario Galaxy 2, provides the voice for Major Burrows. Major Burrows shares his boss music with the Gold Leaf and Toy Time Galaxy's Undergrunt Gunner. At the end of the first game, Captain Toad assures to Mario that, with him and his crew as royal guards, nobody would ever kidnap Princess Peach again, including "giant, overgrown moles", referencing either Major Burrows or a standard Undergrunt. This page was last edited on March 14, 2019, at 05:32.